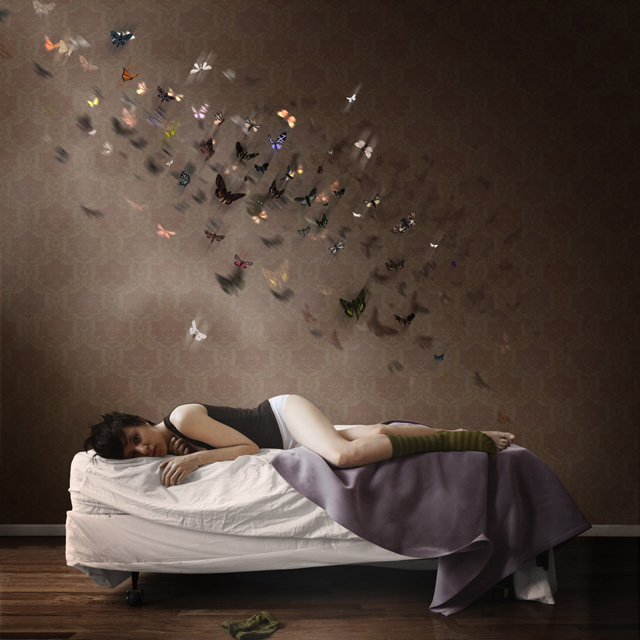 Haley Jane Samuelson - Butterflies. We are so excited to announce our Juror for the Fifth Annual New Directions show coming up in January of 2011.
wall space will be teaming up with David Bram of Fraction Magazine to jury ND11. This years focus is portraiture. The show titled Moments of Being, is looking for new ways to talk about how we see each other, that moment of connection between photographer and subject. As photographers, we look for faces and expressions that tell stories. We look for character. We look for emotion. We look for the hook, that moment of being that creates a compelling portrait. Like a modern physiognomy, a portrait tells a story equal parts subject and photographer in a single moment. Photographs by Emmet Gowin and Sally Mann (for example) show a trust and a relationship between the photographer and the subject. There is a connection that is clear to the viewer; this is what I am looking for. I will also be looking for unique styles and interesting compositions. The images might be quiet, honest, sexually charged, or pure. These portraits, color or black and white, should convey a unique and powerful moment of life. If you wish to submit, here are the important dates for the show. artist reception with David Bram – 12 January, 2011 6-8pm. for more information, please contact the gallery or log onto our information page on our website. All entries are considered as submissions to wall space gallery, as well as to Fraction Magazine for potential representation and exhibitions.